Side hustles are all the rage these days. Everyone seems to have one, and some even translate into big money! However, in my experience, few grad students are aware of (or understand how) to get one going. Even fewer faculty seem to be aware of how they could have one themselves OR how they can support their students in this endeavor. 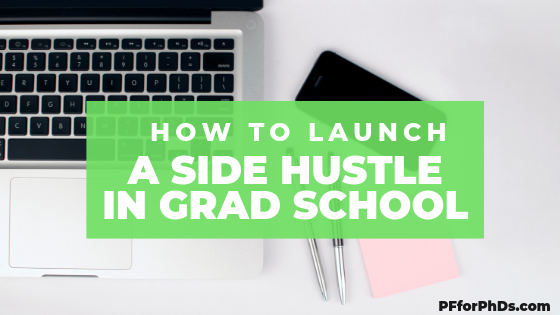 In this post, I’m going to talk to you about why you want to launch a side hustle, and why it’s worth your time to do it in grad school. If your a faculty member these tips can also apply to you! Today’s article on how to launch a side hustle is by Dr. Leigh A. Hall. To read an article today by Emily, please visit Leigh’s website, Teaching Academia. A side hustle is a way to earn extra cash. Ideally, it’s going to be something you are super passionate about because you will be spending extra time creating it. Side hustles happen outside your current full time job (or graduate studies/assistantship). You decide how much time you want to devote to it and when you want to put in the hours. You can work with someone else, but most side hustles tend to start out as solo ventures. As they become more successful, you may find you need to pay others to help you. Some people have such successful side hustles that they eventually leave their full time job and devote themselves solely to their project. Why Should You Launch A Side Hustle? You might be thinking you have enough to do right now. You don’t need to have extra demands on your time. And there’s no guarantee that a side hustle will pay off anyways, right? But think about it this way – if your side hustle is inline with things you already enjoy doing then you’re not wasting any time by devoting yourself to it. If you were going to do it anyways, then you lose nothing by seeing if you can generate some extra income by sharing your work with others. However, the side hustle is not just about you. While it can be a great way to generate extra income, ultimately you are providing a service that benefits others. If people are willing to pay you for your work – whatever it may be – that means they find value in it which means you are enhancing the lives of others in some way. Finally, a side hustle can allow you to establish yourself beyond your academic career. It will allow you to connect with more people, and different people, than you likely would through academia alone. This can bring you a whole host of opportunities and open doors that otherwise would have stayed close. Your work as an academic will likely reach a narrow subset of people. Add a side hustle to that and you can expand your reach. Ok – you’re interested but unsure about where to start. The first thing is to figure out what you want your side hustle to be about. It can be connected to your day job, but it doesn’t have to. If you have a hobby that you are exceptionally good at then you could turn that hobby into your side hustle. It doesn’t have to extend from your job. For example, several years ago I ran a successful yoga blog. I’m not a yoga teacher. I just wrote about going to yoga classes and what I learned in the process about myself. Eventually the blog ran its course, but I was able to get some great sponsorships and support along the way. Because my blog added value to the yoga community, companies would send me yoga mats, clothes, shoes, all kinds of goodies for review. I even got to review a meal kit service so I had groceries mostly paid for now and then. My yoga practice was a serious hobby, and it was able to generate some income for me – even if just through free products – that I enjoyed and benefited from. Currently, my side hustle extends from my job. I have a number of courses I sell. Do I generate massive amounts of income? No, but I do enjoy a nice supplement that I can do with as I please (I often just save it). The key here is to pick a niche that you enjoy and that you want to share with others. And it’s perfectly fine to have both a hobby and a professional side hustle! You get to set the hours and how much you will be involved so do what’s best for you. A website. You can get one for free (wordpress.com) and later move to a paid version. A free version lets you test the waters and play around without the stress of having to pay for it. A YouTube channel: I highly recommend this. Everything is going in the direction of video. A channel will allow you to build an audience. And while you are giving people content for free, once they see that you have something of value they will start to buy your more in-depth products. Patreon: Admittedly, I need to get this one going. Patreon allows you to sell memberships at varying tiers. For example, you might have people who give you 5.00 every month in exchange for specific things you create or offer. A second tier of people might give you 10.00 a month and receive something different/more. You get to decide how to price the tiers and what people get in return. Selling Courses: You may want to create one or more courses that people can access asynchronously. A number of platforms allow for this with varying advantages and disadvantages. Udemy allows you to post your courses free of charge, but they will take a hefty fee in return (they also help with marketing your courses). Platforms like Teachable and Thinkific require you to pay an ongoing fee or yearly subscription for your courses to be hosted, and they do no marketing. However, you stand to keep more of your money each time you sell a course here than on Udemy. Who would be interested in your product/creations? A side hustle is going to require a mix of free and paid content. You are going to want to have a website or YouTube Channel (likely both) and a plan in place for content development. What do you want to sell? When will you find time to create this content and build out your offerings (both free and paid). There is no best time to launch. You need to know what it is you want to do and what platforms you want to start out on. Then you go. You don’t need to do everything at once, and you can build out along the way as you get comfortable. The trick is to not get caught up on something not being good enough or that you only need to do X and then everything will be perfect. We’re not looking for perfect here. We’re looking for a few key things to be in place and then it’s time to go. Having a side hustle can bring in extra income while allowing you to grow and develop professionally or with a hobby. The sooner you get started the sooner you will start to reap the rewards. Dr. Leigh A. Hall is a professor at the University of Wyoming where she holds the Wyoming Excellence Chair in Literacy Education. She’s had a side hustle for four years now selling courses that can benefit graduate students and early career academics. See her work at TeachingAcademia.com. Today’s podcast guest is Dr. Caitlin Faas, an assistant professor of psychology and perennial side hustler. We discuss her history with side hustling and her motivations for pursuing it. Caitlin’s current side hustle of academic coaching dovetails so well with her primary role as a faculty member that she’s even planning to include that work in her tenure packet. Her work involves coaching and teaching about time management, productivity, and overcoming psychological barriers to academic success, so listen through the episode and check out her website to learn the tips that work well for her and her clients. Subscribe on Apple Podcasts, Google Play Music, Stitcher, or Spotify. Give your feedback on Season 1 and influence the direction for Season 2 through this form. Dr. Caitlin Faas is an assistant professor at small liberal arts college in Maryland. She’s had her job for five years, and soon she is submitting tenure packet. She went to graduate school at Virginia Tech, where she studied human development and family studies. She’s the developmental psychology professor in her department. Her research focus is emerging adulthood. 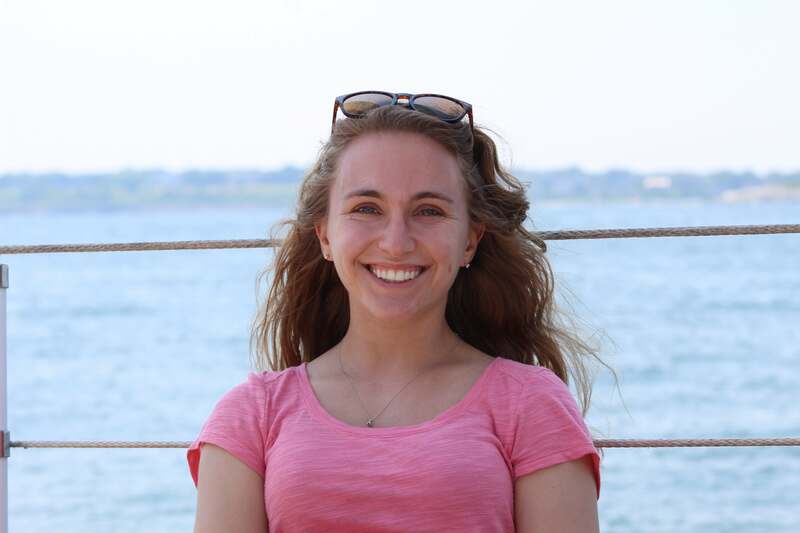 For her side hustle, Caitlin runs a business to coach busy professionals as they try to integrate school and academics into their daily life. She provides career direction and productivity tips to her clients, as well as offering advice on her blog and social media. Her clients are associate professors, graduate students, and professionals considering applying to graduate school. 3:17 Did you have a side hustle as a student? Caitlin has always valued hard work and earning her own income. As an undergraduate, she worked while being a full time student. Then as a graduate student, Caitlin worked at the local yarn shop during the summer and had a couple corporate retail work experiences. Having extra spending money was her motivation for her side hustle. She’d usually spend her income from the yarn shop on yarn for her knitting hobby. She also used her money for non-funded academic opportunities, like going to conferences. Caitlin and Emily both agree that having outside activities, whether paid or hobby, helps you personally while you’re a graduate student. A side hustles is a valuable way to learn other skills and discover what you enjoy doing. Subscribe to our mailing list to receive the 7-part video series on increasing your income as a graduate student, including side hustles and passive income. 8:10 How did you transition into self-employment as your side hustle? Caitlin went from graduate school directly into her assistant professor position. For the first two years, she focused on her productivity, time management, and personal values. She decided that she wanted to work 9-5 and use her non-work time as she chose. She trained for a half marathon and on her runs, she listened to Nick Loper’s Side Hustle Nation podcast. The stories she heard on the podcast inspired her to start her own business on the side. Starting a coaching business seemed like a way for her to take more control of her career trajectory in the face of an uncertain economy. In contrast to other professors who may do consulting on the side, Caitlin decided to create her own platform to reach the general public. She wanted to help people beyond her students and outside her own academic network. 15:13 What do you do in your business and how does it complement your primary job? Caitlin is a personal coach, working with clients to improve their productivity, time management, writing and academic life. To get started, she took coaching classes and offered her expertise to a broad audience. Most clients needed help determining if they should leave their job to go to graduate school, so Caitlin’s work has evolved to focus on that audience. She spends about 8-10 hours per week on her business during the academic year and 20 hours per week during the summer. This time is spent coaching clients, collaboratively editing writing and teaching writing skills, speaking at conferences outside of her field, engaging her audience on social media, and on networking calls. She recently began working with corporations to help bridge generational differences. For instance, she has advised business how to help baby boomers and millenials work better together. She’s been paid to give webinars in a corporate setting. Caitlin and Emily comment that academics are trained to view much of their work as voluntary service. Academics do many tasks, like reviewing papers, as a service for no extra money. Yet through a side hustle, Caitlin is paid for these tasks, generating income for her valuable skills. 20:50 What benefits have you experienced from your side hustle? Caitlin benefits from flexibility with her finances that come from her side income. She has student loan bills, so this income helps her make those payments. She dreams of financial freedom. Also, Caitlin likes that her side hustle gets her outside of the ivory tower. She enjoys getting to know other people and helping people. Her goal is help people feel empowered to make decisions about their career and be productive. Through her business, she feels in control of her career, where she can learn lessons and grow opportunities. 23:02 Can you tell us about your website? Caitlin’s website provides free content for interested people. She includes a blog with posts about productivity, self-improvement, and deciding whether to go to graduate school. Every two weeks, she sends an email newsletter. She provides videos with a transcript and worksheets. Her first website was very simple and didn’t have much content. Having a website was an important first step to establish her business and build an audience. As she earned more money, she could put some of that money back into her business. Now, she hires a graphic designer and video editor to improve the quality of her online products. 25:34 How do you manage your time between your primary job, side hustle, and other commitments? As a productivity coach, Caitlin practices what she coaches. She is serious about working her primary job 9-5 and having free time on evenings and weekends. She is super strict about sleep, so she always make sure she has 8 hours of sleep each night. She encourages people to start with getting enough sleep. Caitlin critically considers how she likes to spend her time, so that she spends it on activities she enjoys. For instance, she has decreased the time she spends editing papers, because she finds more fulfillment from coaching clients in person. She read Gretchen Rubin’s books for inspiration, and suggests that others look for productivity role models to follow. Join the mailing list to receive our 7-part video series, "How to Increase Your Income as a Graduate Student," including side hustles and passive income. 30:48 How does your side hustle interact with your primary job? At first, Caitlin kept her business idea quiet. Now that she has established her side hustle, she is open about it with people in her department. She says typically people don’t think too much about what she’s doing, but colleagues ask her about time management. Coaching clients has made Caitlin a better professor, because skills she learned while she trained to be a coach showed her how to be a better teacher. She’s including information about her coaching business in her tenure package. She is making the case that her coaching business has improved her performance as a professor. 33:38 Would there be a situation where your side hustle became your primary job, or alternatively, you would stop it? Caitlin has other goals that are fulfilled through her professor position. For example, one of her goals is travel, and her professor position gives her the opportunity to take her students abroad. She took her students to Greece, and her travel was paid for. She sees this as a perk of being a professor. She is in a growth mode in her coaching business. She has 8-10 hours each week, so she’s examining how she can grow even though her time is limited. Additionally, Caitlin and her partner will be foster parents for teenagers soon. This family life transition may change her priorities and time management. 37:12 How could someone with a PhD find a side hustle that complements their primary work? Caitlin recommends completing “What’s your purpose?” and “What are the things you like to do?” activities offered on several entrepreneur websites. Even though the entrepreneur path may not seem like an intuitive one for many with a PhD, Caitlin suggests plugging into the entrepreneur network to find support. Through a side hustle, you can truly explore what you want to do and find something you love to work on. When you find something that you love, Caitlin says you have energy to overcome road blocks and make it grow. If you don’t love the work, you have the freedom to change direction. Caitlin and Emily are both part of a self-employed PhD network led by Dr. Jennifer Polk. The network is very supportive and includes a diversity of people. Caitlin and Emily welcome people to reach out to them directly. What is your side or temporary job? I work as a consultant for a Gait Analysis Laboratory on campus. I maintain the code that provides the interface and analysis packages for the laboratory. How do you balance your job with your graduate work? I set aside 5 hours per week in my schedule. Typically, I look at my weekly schedule Sunday night and find some time that I physically block off – I ensure that I work 9 hr/day in total, therefore ensuring I give enough time for my research (minimum 40hrs/week). Does your job complement your graduate work or advance your career? Yes, this job can definitely influence my career. Much of my research requires me to create and maintain code, so this side hustle is good practice. Additionally, the graduate student who held this position before me went into consulting and found that this position was a great talking point in interviews and demonstrated his skills that made him a great fit for a consulting position. How did you get started with your job? Another graduate student in my lab held the position before me and recruited me to take over from him after he graduated. Is there anything else you would like to share about your experience? I enjoy the challenges of this position, and the more translational nature of this work – the lab uses this data to evaluate the healing progress of pet dogs after surgeries. They also use this data to guide future surgical decisions – as a dog lover, this is very motivating! I work as a group fitness instructor through the Cornell Fitness Center. I currently earn $18/hr, but anticipate raises the longer I teach and more certifications I receive. Additionally, this position allows me to get free gym membership. I teach 1-2 classes per week and select times that will not conflict with my experiments – right now I am teaching on Sunday nights, so it is a nice calming way to start my week. My job does not directly impact my graduate work, however I study biomechanics so I can make very broad connections between my work and my side hustle. Additionally, the teaching experience that comes with group fitness will certainly add to my confidence should I go into academia & need to teach or give public presentations often. Another graduate student in my lab taught group fitness classes and recruited me to join & learn how to teach. I love being able to connect with students – both in and out of my department – in a more social and healthy way! I also love being able to help people in their fitness journeys, and having an excuse to learn more about fitness and healthy lifestyles as I go through this job. One of the biggest challenges associated with a side hustle is paying the right amount of tax on your PhD side hustle at the right time. Understanding your tax due and tax benefits can be even more complicated for PhD side hustles because of the unusual pay structure and benefits that some grad students and postdocs receive. If you haven’t yet, read last week’s post on the best financial practices for PhD side hustles, and pay particular attention to how to categorize your side hustle (employment, self-employment, neither) because that designation plays a very important role in taxation. The assumption that your side hustle income is much less than your stipend/salary holds here as well. This post is also US-specific. The two types of tax on your PhD side hustle that you should be prepared to pay are income tax and FICA tax. The income tax on your PhD side hustle income will be equal to your side hustle pay for the year multiplied by the marginal tax bracket your primary job tops out in (e.g., 10%, 15%, 25%). The exception is if your side income bumps you into the next higher tax bracket, in which case part of the income will be taxed at your previous marginal tax rate and part at the higher marginal tax rate. The FICA tax rate for each person is 15.3% (12.4% for social security and 1.9% for Medicare; in 2017, social security is not taxed on the portion of your income that exceeds $127,200). If you are an employee, you pay half of that rate (7.65%) and your employer pays half. If you are self-employed, you pay both halves, which is called self-employment tax. If you have tax withholding set up accurately at your primary job, it will only cover the tax due on your primary income. 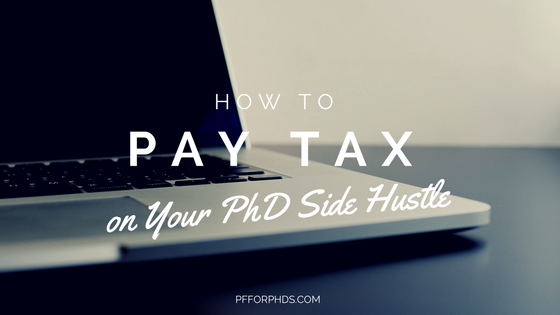 You will additionally need to send the IRS regular payments for the tax on your PhD side hustle income. If you are an employee in your PhD side hustle, you will file a W-4 with your side employer to have income and FICA tax withheld from that paycheck. The simplest thing to do is claim “0” allowances on your side hustle W-4 and the appropriate amount of allowances on your primary job W-4 (if you have one). For a more detailed calculation, complete the Two-Earners/Multiple Jobs Worksheet on the second page of the W-4. If you are self-employed in your side hustle and have tax withheld at your primary job, you can increase your withholding at your primary job to cover the additional tax on your PhD side hustle by filing a new W-4 with fewer allowances and/or an additional dollar amount to be withheld from each paycheck. This is a good strategy if your side hustle income is very regular. If you are self-employed with an irregular side income and/or you do not have tax withholding on your primary income, you will probably be required to file quarterly estimated tax. Quarterly estimated tax payments should be familiar to most PhDs who at some point received non-compensatory income such as from a fellowship or training grant. If you currently receive non-compensatory pay and are making quarterly estimated tax payments, simply adjust your calculations on Form 1040-ES to account for your PhD side hustle income. For those not currently making quarterly estimated tax payments, the process is relatively straightforward. You use Form 1040-ES (page 8) to estimate your income, tax due, and existing tax withholding for the year. If you will owe more than $1,000 in additional tax and don’t fall into an exception category, you are required to pay that additional tax over four payments taking place in April, June, September, and January. A quick way to take care of this if your tax withholding at your primary job is accurate (you didn’t receive a large refund or owe a lot of additional tax on your return last year) is to calculate your additional income and self-employment tax due for each quarter when the quarter ends. Multiply your income for the quarter by 15.3% plus your marginal tax rate and use that amount as your estimated tax payment. Whenever you receive side hustle income into your personal bank account (whether that is directly from your client/customer or via your business checking account), you should set aside the appropriate fraction of that income to go toward your tax payments. The best practice for doing this is to set up a separate, dedicated savings account that you solely use for future tax payments. From each bolus of income (or once per month), transfer into your dedicated savings account the fraction of your income that will go toward your income (and self-employment) tax, as calculated above. One of the best perks of having a PhD side hustle is that it might qualify you for tax benefits not conferred by your primary job, especially if you are a grad student or fellow. If your primary job gives you non-compensatory pay (i.e., your stipend or salary is not reported on a W-2), you may be ineligible for certain tax benefits that are reserved for people with “taxable compensation” or “earned income.” Examples are Individual Retirement Arrangements (IRAs) and the Earned Income Tax Credit. Therefore, receiving compensation/earned income from a PhD side hustle qualifies you for these tax benefits to some degree. One of the few drawbacks to receiving a fellowship is that fellowship income is not eligible to be contributed to an IRA, which is a tax-advantaged retirement savings vehicle. For fellows, earning just a small side income from a PhD side hustle during calendar years in which you would only have fellowship income can completely reverse this problem. In that case, you can contribute to an IRA up to the amount of your taxable compensation or $5,500 (in 2017), whichever is lower. If your PhD side hustle is self-employment, even more tax benefits become available to you, such as business deductions. Keeping your personal and business account separate, as discussed in last week’s post, is also extremely helpful for keeping track of business deductions. You should pay for expenses that have solely a business purpose directly from your business checking account. One step to take when you become self-employed is to diligently track your usage of anything that has both personal and business purposes. You might decide to take a business deduction on the fractional use of those resources. For example, you should track the mileage in your car, noting the miles used for business. Your internet usage is another deductible expense, again for the fraction of the total time it was in use. If you buy a new computer in a year that you are self-employed, you can deduct part of the cost, but you’ll need to track the fraction of the time that you actually use it for your self-employment work vs. other purposes. Self-employed people are eligible to create retirement accounts for themselves that take the place of a workplace-based retirement account and greatly increase their contribution room above that provided by an IRA. The additional retirement contribution eligibility is especially beneficial for grad students and postdoc fellows who don’t have access to a workplace-based retirement account (e.g., their university’s 403(b)), and in some cases the self-employment retirement account is a superior alternative to the workplace-based retirement accounts available to PhDs with Real Jobs. Self-employment retirement accounts come in a few versions, and the best choice is dependent on the number of employees you have, your income, and your desired savings rate. The most common self-employment retirement plans are the individual 401(k), Simplified Employee Pension (SEP), and Savings Incentive Match Plan for Employees (SIMPLE IRA). How do you pay tax on your PhD side hustle? Has your side hustle conferred any tax benefits that you didn’t already receive through your primary job? Whether you started your PhD side hustle to fund your basic monthly budget, pay for lifestyle upgrades, or further your career, you must put in place a few foundational financial practices to ensure that you use your money effectively and stay on the IRS’s good side. These steps are simple, easy and take only a short time once the habits are in place. This post assumes that your PhD side hustle income is much less than your stipend from your grad student position or your salary from your postdoc/Real Job. If your side hustle income becomes quite regular and compares with your primary income, you should extend your financial and business planning beyond the steps outlined in this post. Regardless, this is a great place to start! Today’s post is about general financial best practices, and next week’s post is all about taxes: how much tax you’ll pay, how to pay tax, and the extra tax benefits such as retirement account contributions. The next section of this post is US-specific, but the rest of the sections are widely applicable. Your PhD side hustle will fall into one of three categories: employment, self-employment, or neither. The category will affect your tax rate and eligibility for certain tax benefits. If you are an employee, that relationship should be made quite clear by your employer. Foremost, you’ll receive a W-2 at tax time, so when you start your position you can simply ask, “Will my income be reported on a W-2?” At this type of side hustle you would probably have regular hours, even if they are only part-time. Examples include a retail job, nannying, or an on-campus work-study job. More likely, your PhD side hustle will qualify as self-employment. Performing similar services for multiple clients, determining when and how you work for a single client, or selling a product directly to customers are all indications of self-employment. Examples include freelance work, babysitting, and tutoring. Further reading: Am I Considered Self-Employed? Finally, you might on occasion receive income that is neither employee nor self-employment income, such as from a one-off activity like participating in a clinical trial. 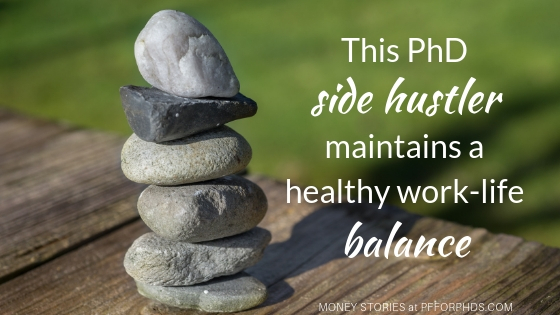 In this case, the activity wouldn’t really rise to the level of being considered a PhD side hustle and it’s not necessary to put the following practices in place (aside from paying income tax). Further reading: Self-Employment or Other Income? One of the best reasons to keep track of the time you devote to your primary job vs. your PhD side hustle is to make sure that your side hustle does not encroach upon your primary work time. The benefits of pursuing a PhD side hustle dramatically diminish if it prolongs the time you spend in training. Further reading: Can a Graduate Student Have a Side Income? When you track your time and know definitively what you are earning per hour, it makes decisions about how to use your time that much easier, whether it’s on your research, PhD side hustle, or personal pursuits. If you mix your PhD side hustle earnings (net of taxes) in with the rest of your money, it very well might disappear into the ether like unbudgeted money tends to do. A better practice is to link a financial goal directly to your side income. That way, every time you work on your PhD side hustle, you know exactly what the money you earn will do for you. For example, if your side hustle money is going toward lifestyle upgrades, you could funnel it into a savings account dedicated to travel, entertainment, or shopping. You could withdraw it as cash and make it your “blow” money for the month to be spend on anything. Assigning it to a necessary budget category like food would also work well if you have a good degree of control over how much you earn and are just trying to motivate yourself to work more/faster. Another common issue that a PhD side hustle can help with is un-/under-funded summers; the more you earn during the academic year and summer, the less stress you’ll experience when you’re drawing down your savings. Finally, assigning your PhD side hustle money to debt repayment is a great way to accelerate your debt payoff. Creating a separate business checking account is just about the first step you should take when you become self-employed. If you are a sole proprietor, your PhD side hustle earnings will be reported on your personal tax return on a Schedule C, so at the end of the day it’s all really your money. However, keeping a separate business checking account that you use for only business transactions helps tremendously with bookkeeping and tax records. It’s also advantageous when you want to save up your income for a business investment, such as a piece of equipment or professional development. Maintaining separate personal and business accounts is also a reasonable step for anyone with an irregular income to take, even if it’s not self-employment income. Instead of receiving variable amounts of income directly to your personal checking account, you can create a degree of separation with a business checking account. If you let a balance build up for a couple months, you can set up an auto-transfer of a regular amount of money from your business account to your personal account that is less than your average income – just like a paycheck – which is easier to incorporate into your budget than a variable income. 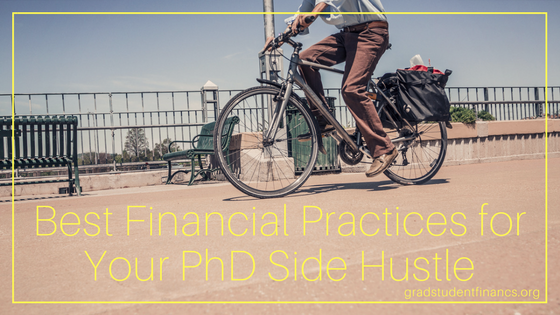 What financial best practices have you put in place for your PhD side hustle?